I got out this afternoon and finished of the rear of the racecar. I’m not completely satisfied, as there are two small creases in the piece of vinyl on the hatch. After four tries, that was as good as I was going to get it. There are really a bunch of compound curves all coming together there (no surface on the hatch is actually flat), and whatever the trick is do laying vinyl on that well is one I don’t know. 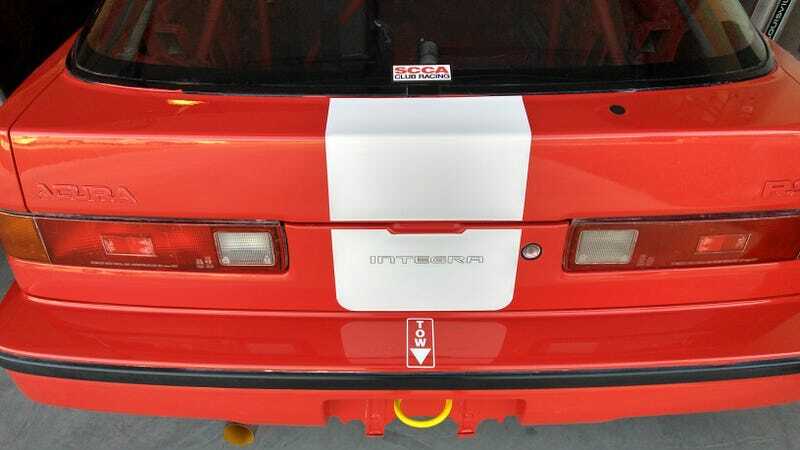 I finished off the back with the OEM Integra decal for the rear (which ain’t easy to find these days), an old SCCA club racing sticker (which is now obsolete as a sanctioning decal, but I like’em anyway and had some left over) and putting some clear surface protection film over the taillights. I used an 8mil film, and it is was superior to the old school way of clear packing tape on lenses.